Liability protection is likely be the biggest benefit you will receive when you incorporate your business. Liability protection, in this venue, consists of two components: (1) Protecting your personal assets when your business is sued, and (2) protecting of your business assets (including real estate, cash and other assets) when you are sued personally. The separation of assets into legal business entities can afford you significant legal protection. Incorporating your business is the first step in creating this separation. Maintaining your business structure is as important as forming it. It is essential that your legal entity is established properly and maintained adequately in order to provide you with maximum protection. Piercing the corporate veil, on the other hand, is what can happen if a legal opponent is able to have your legal entity disregarded. This can happen when your entity has not bee properly established and maintained. By law, when you incorporate or form an LLC, you are protected by legal statutes. There are provisions in the law whereby you are protected from personally liability for business debts. Of course, business owner is responsible as to not defraud any creditor and properly organize, operate and maintain the business. Just speaking about the protection offered by the common forms of business, we can illustrate this by graphing the level of protection you are afforded when transacting business as either a default form, being incorporated or having formed an LLC. 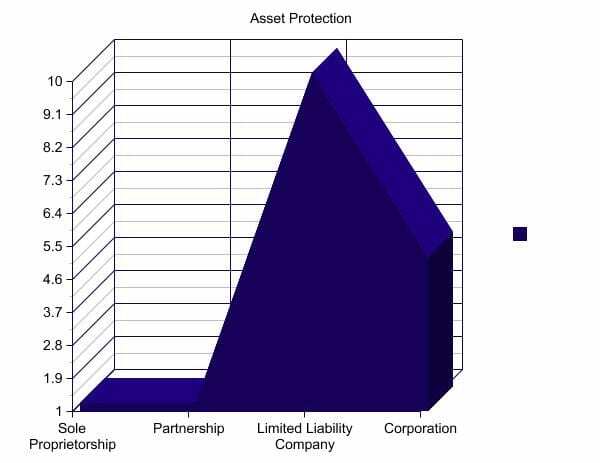 As you can see from the graph above, by transacting business as a sole proprietor or partnership, a default form of business, you have no protection from business obligations. This means that any debt or responsibility that the business has, the business owner has, personally. There is no separation with default forms of business, no matter how you operate it. Legally you and the business are one in the same. A court will rule as such, leaving you personally vulnerable. Limited liability companies score excellent marks for personal asset protection from business responsibility. Though a newer type of entity than the corporation, the LLC has a good reputation of performance in protecting business owners, personally, from obligations related to the business. Corporations get a near perfect score in this category. Having an outstanding court-proven record for hundreds of years, Corporations offer the strongest reputation for liability protection when the business is sued. If the business is organized properly, operated properly and maintained correctly, it is very difficult, in most cases, that a creditor can pierce the corporate veil and pursue your personal assets, making it an ideal legal tool to own and operate a business. Brad has a contracting business in California and has been remodeling homes for 30 years. On one of his job sites, a delivery person fell and hurt his back. This resulted in a lawsuit where the individual who was delivering materials sued Brad's business for negligence and an unsafe work site that resulted in injury. Brad was smart and organized an insurance policy for just this type of incident, however the policy's limits fell short of his legal opponent's settlement. Brad's business may or may not have cash reserves to fulfill the settlement obligation. Personally, Brad owns a very nice home, has 2 vehicles, a savings account, IRA and personal effects that comprise his wealth. If a court ruling awarded the plaintiff a settlement that is beyond what his insurance covers (which happens more often than not) his business could be liable for the balance. If Brad was operating as a sole proprietor, his legal opponent could take the settlement and sue Brad personally for the business obligation where his personal assets are exposed to seizure by the court to satisfy the financial responsibility of the settlement. Brad would have no liability protection from business obligations being a sole proprietorship. If Brad had properly organized his contracting business as a Corporation or Limited Liability Company, and maintained his business entity properly, his personal assets are safe from this incident. His business property could be vulnerable to being used to satisfy the obligation, however his personal wealth is safe. Another form of protection that could persuade your decision on what type of entity to incorporate or form, is the protection of your business assets in the event of a personal lawsuit. If you are sued personally, what form of protection do you have for assets encumbered in your business entities? 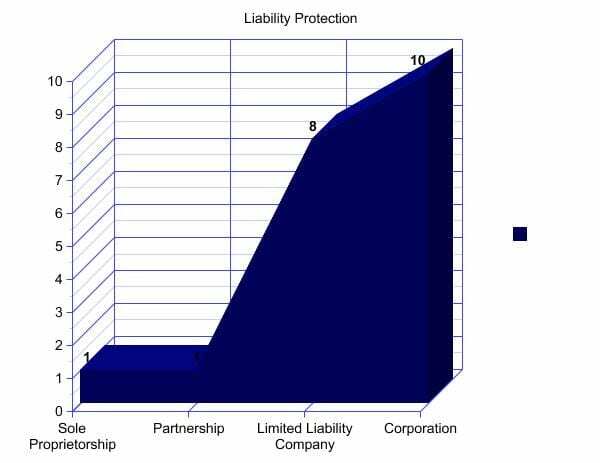 This is where corporations score lower on the protection graph. There are no provisions in the law that say corporate stock cannot be used to satisfy personal debt. There are provisions in the law that make assets owned by an LLC, out of reach for personal obligations. This is where the LLC really shines, for asset protection. This makes the LLC ideal for owning real estate, cash or stock market investments. The default forms of business, sole proprietorships and partnerships, both still score the lowest marks for protection performance. These forms of business offer no protection from personal or business obligations. Continuing with the first example, Brad's contracting business is growing. It owns equipment, trucks, tools and a small office building with a warehouse to store the property. Brad is driving his personally owned car home from work and drops his cell phone, and when reaching for it, he runs a stop sign and hits a pedestrian. This results in severe injury and his automotive insurance coverage only pays out $100,000 total for the accident. He is sued in court for damages and medical expenses of the accident victim. The plaintiff is awarded a settlement of $465,000 that is served to Brad, personally. If Brad was not incorporated, his business property, equipment and tools could be subject to seizure by the court to satisfy this financial obligation. There is no asset protection offered by default forms of business – your personal wealth and business assets are free for the taking in the case of either a business or a personal legal battle. If Brad had formed a Corporation that owned his business property, tools and equipment, it may not be protected from his personal obligations. There are no legal provisions that state his personally owned corporate stock is safe in this case. If Brad had formed an LLC, the assets encumbered in the company are protected from his personal obligations. There are legal provisions that protect the assets within an LLC in this case. Any creditor can pursue you further by seeking a "charging order" against your LLC interest. This means that if any distributions are made to Brad, from the LLC, the judgment creditor has legal rights to those proceeds. This is a double edged sword and what is about to be explained makes the LLC an even stronger asset protection vehicle. Even in the event of a charging order, if you have a clause in your operating agreement that allow profits to be held in the company for future use, you can make the creditor aware that NO DISTRIBUTIONS OF PROFITS will be made. Here's the protection device: The IRS will hold the entitled party responsible for the tax liability of those business profits, whether or not the funds were ever distributed. So here your creditor, with a charging order, would not receive any of the profits, yet be responsible for the taxes on the profits that were never distributed. This will usually result in your creditor removing the charging order. See Revenue Ruling 77-137 for more information. As we have gone through the facts and supported them with examples, you now know that default forms of business, the sole proprietorship and partnership, offer little or no liability protection, whatsoever. If the business is sued, the business owner's personal assets are exposed to satisfy any obligations. If the business owner is sued personally, any business assets can be used to satisfy the personal obligations. Default forms of business are high-risk and any entrepreneur who operates under one of these forms of business is vulnerable to twice the exposure. Corporations are excellent vehicles to protect your personal assets from business liability, shielding the shareholders from any personal liability of business transactions. Limited Liability Companies offer the exact same protection, with a shorter history of success in the courtroom. Being a relatively new form of business, the LLC has to mature in that sense. The LLC offers outstanding protection from business obligations while affording asset protection that a corporation cannot. The LLC has fewer formalities than a corporation with equal protection from business liability, while extending things further by adding the asset protection that no other entity (that we discussed) can.